Poker has taken a back seat lately. I still can’t remove myself from the ‘can’t be bothered’ corner. But I have played a couple of forum games, fairing not too badly in some of them. PKR games on a Friday night have been my more successful games of late, winning 2 out of the last 3, including last nights game. Games at Abs/Vegas though have been the complete opposite, even going out on the very first hand last week. But for my shortcoming in forum games at Abs/Vegas, I am doing a tad better in sit and gos, especially multi table sit and go’s. Last night I played a 45 player game along with a few of the skype crew. As is now tradition on a Friday, I had had a few beverages down my neck before hooking up with the crew. Once the game started I felt good and played well – that is until the final table where I went a bit card dead. Being almost 3am I started losing concentration and taking chances when there were 3 players left. I say chances, but most of the time I had half decent hands and I was up against a complete monkey and his sidekick! Needless to say, the one hand where I thought monkey play was happening I got stung big style. For once the guy had a decent hand. Anyways I finished 3rd in that game for just over $14 and along with the $22.50 won in PKR earlier, I made a nice wee profit from the two games from a $7 investment. I enjoyed the games last night. I felt as though the recent lethargy had lifted and I had that will to win return. Long may that continue. This weekend see’s more challenge games at Vegas. Not forum challenges, but country challenges. A bit of a silly concept as US players have other countries outnumbered big style, so are likely to win it for their country. But that won’t put me off in the slightest. I’ve done well in the past in these games (a 4th place last time out), and I don’t really play for the country. I play for myself. I’m more interested in making money for myself than gaining a freeroll for my country! The forum is kicking off another league tomorrow, with points scored in private games. It’s not something I will be focusing on to be honest, mainly because I play virtually zero games during the week and only play a select few at the weekends. I would probably have to win every single game I entered to be anywhere near winning. Even then, I’d probably still be beaten by those that will play virtually every game. So the league isn’t really on my ‘to do’ list. OK, update over, I’m off to get ready for the country challenge game. Hope to see ya all at the tables at some point. Take it easy. Want to play live – start with a home game! The poker boom just seems to get bigger and bigger, and eventually, those who play solely online will probably want to try a live game in a casino at some point. And I have to say that its a completely different ball game to online poker! Here are some common sense differences between online and live games. you can’t hide behind a computer screen playing live. People will be watching you looking for tells. As a novice you will probably show every tell in the book if you are not careful. you won’t see as many hands per hour live as you would in a live game. Online you could easily see between 60-80 hands per hour. Live, reduce this to around 20 hands per hour, or less. no betting buttons / slide bars to make your bets in a live game. You have to concentrate and watch the betting. Learn how betting works in a live game before you go. There are numerous other things I could point out but these are the main items. Every casino or cardroom will have different rules for within their premises. You won’t find out what they are until you actually visit. But the actual game of poker will be just the same as what you are used to online. So, onto the home game. For the complete novice, wanting to play live, I would suggest getting some friends over for a friendly game of poker before even attempting a casino. It’s better to learn how to play live in a comfortable environment than in an alien environment against complete strangers. The basic items needed are obviously a deck of cards. Try and get a quality deck. Not the flimsy paper ones. Go for a high quality plastic playing card. You can buy genuine used casino cards off the internet for around £2/$4. These will have been in actual use in the casino, but will have been ‘clipped’ so that they can’t be used in the casino again (for fraudulant activities). Alternatively, you can get a half decent deck for around £5/$10. If you really want to push the boat out, invest in a set of KEM cards. These will set you back around £15/$30, but are argubly the best cards out there. Next basic item is a chipset. There’s no point in playing with matchsticks if you are wanting to proceed to playing in the casino. Buy some chips – even jusy a cheap and tacky plastic set. You can get chipsets very cheaply off the internet and at a lot of high street stores. Again, you get what you pay for. £10/$20 will get you a very cheap tacky set but will be good enough to start your home games. If you have the money, you can invest a couple of hundred pounds for casino look, weight, feel and sound, clay poker chips. You want to learn how to bet with chips so it’s not alien to you when you do eventually go to the casino. Also get a dealer button, although you can use almost anything to signify a dealer button (like a lid off a jar). Dealer buttons cost around £3 / $5. Ideally, you want a good sized playing surface. The kitchen table is a good starting point. Buy some felt to put over the table so it ‘feels’ more like a poker table. If you intend to have home games on a regular basis, why not invest in a poker table. They come in all shapes and sizes and at prices to suit all budgets. Obviously, the more you pay the better quality table you will get. You can also find plans for building your own poker table on the internet. You can get these free and all you have to pay for is your materials and some time and patience! OK, now you have the basic set up, you just need a few bits and bobs to have your home game off and running…. FOOD – now if you are anything like my mates, food will never be wasted. Have a selection of crisps (or chips to you US folks) and nibbles available. You don’t have to go all out for 3 course meal! MUSIC – I normally have some music playing in the background – not blaring out, but loud enough that its not a distraction. For the game itself there are a few things that you must make clear before the game starts. You should have some basic rules. As I’ve said, every casino has its own house rules – you should too. These should include blind levels, time between blinds, string betting, betting out of turn and who decides on disputes. You as host should have final decision on any disputes. Don’t just play for the fun of it. Have a buy-in for your game. When there’s nothing to play for, people will tend to play stupid hands and can get easily bored. Its suprising just how much more, people try to win when there is cash on the line! Set your buy-in at a level everyone can afford. If you make it a £5 ($10) buy-in you might want to have a rebuy period of say one hour. 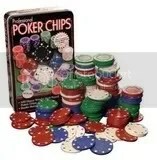 I’ve played a few games where the buy-in was £5 for 2500 chips and rebuys were £1 for 1000 chips. Rebuys help to swell the pot. Just remember to have a decent payout structure. If you have 9 or 10 playing pay out to the top 3. If you only have 5 or 6 then payout to the top 2 and for less than 5 players payout winner takes all. Use your home games as a learning curve for playing live. Not just for you but your mates as well. Help eachother for when you do hit the casino. Ask them if there are any tells you show, whether it be a physical tell or a betting pattern or general mistakes you make. Take all comments on board and try to eradicate them from your game. In return you have to help them too. It aslo means a tougher game when you all meet up to play again! The natural step to take before heading for the casino is to play home games. The more you play, the more comfortable you will feel at the table, and the more confident you will get. Once you feel you are ready to take on the world, head off to your local casino / card club and play the low buy-in games. Its a whole new learning curve, but at least you will have had the basic preparations. I still don’t have that urge to play poker at the moment – well not to the levels I have previously enjoyed – but I am starting to play one or two games. I think it gonna take just a little longer to get back to normal. I have come to the realisation that I have hit the poker burnout wall with a hell of a whack. I seem to have climbed that wall but am now sitting precariously on top of it – teetering on the edge between the precipice and poker heaven, as it were! I hope to play a few games this week, including some of the forum games. This should let me know if I’m going to get to the other side of the wall or if I’m going to fall off backwards! Anyways… on to my main topic of discussion…. expanding your game. Or, another tool to expand your game. Most people know that if you want to expand your knowledge of poker there are some things that you should really try to do, like read poker books/articles; discuss your plays with friends; get someone to analyse your play during a game etc… These are all valuable learning tools for all poker players. But I want to look at a different route – hand histories! Hand histories can be a great learning tool if you are prepared to trawl through the data, but more importantly give you instant access to a specific hand that you want – or need – to look at again. Analysing your own play, or even better having someone analyse it for you, can be invaluable to improving your game. Blinds are 10/20 and I’m the shortstack at the table with around 700 in chips, after having to (rightly) fold a couple of big hands. I’m in the SB. I show . Petrafyde shows . No help on the turn and river so I’m out. I am absolutely raging. Not that she called the inital raise by Marty – it was only double the BB after all, but that she called a big re-raise. J10 suited is a garbage hand when you KNOW you are beaten. I let Petra know my feelings and leave the table to go and kick and punch anything I can find! Where’s this going you may ask, and what does this have to do with expanding your game? Well, on retrieving the hand history, and analysing it over and over, I changed my initial assumption of how Petra played the hand. And here’s my findings…..
Anyways, analysing this hand in depth has proven to me just how useful hand histories are to the online poker player. There will be so many times when you read through them and you will congratulate yourself on a good hand played, or berate another player for what you consider to be a poor play just because your Aces were cracked. But look carefully at the histories. Gather all the information you can from them, from position to chip counts; how you (or others) have played previous hands – do they seem to be catching, only playing monster hands, or look as if they could be on tilt? Hand histories will give you more information about how others, but more importantly, how you play, than any other form of reading material. Over time, you will start to see patterns emerging in your play – things you can improve on, things you need to remove from your game or things you need to do more. So in short, sorry Petra for bitching about the hand. We both agree you got lucky with the flop, but the initial call was a good one. As we all know, in NLHE, the game is won on the flop most of the time, and it proved it in this case. But more importantly, this particular hand, and the analysis that followed has shown me a different outlook on how to play connectors against someone you know has you beaten pre-flop, and hopefully I can use it to the same effect as you did in this hand. Lastly, the answer to the question I was asking myself most about this hand – what could I have done to avoid that situation? Only one thing in my book – ALL IN! Even with my shortstack going all-in preflop, I don’t think Petra would have risked a 1/3 of her chips with J10 . Lesson learned me!